It's always wonderful to be elegant, it's always fashionable to have grace, it's always glamorous to be brave, and it's always important to own a delectable perfume! Yes, wearing a beautiful fragrance is in style at any age! ― C. JoyBell C.
My addiction to perfume began when I was a child. I grew up in a family where members love perfume. I can still clearly recall the nice smell of my mama. Growing up, I became aware that good looks coupled with great smell equals a dashing personality. It is a good thing that I have a very keen sense of smell. My exceptional gift of sniff has both an advantage and disadvantage. One advantage is that I very well appreciate nice scents. This made me decide to take a class on perfumery. Yes, dear. Yours truly knows how to make perfume. But the perfume we concocted is quite cheap. And that can be a problem since cheap perfumes come off easily. So, I can very well say it pays to buy original perfume. If you buy one labelled eau de toilette, that means it has water in it. The distillation of the scent makes it wear off easily. Look for one with parfum which is worth it in the end. Based on experience, it is too much hassle to make and formulate your own perfume which doesn't last as long as the original. Buying from abroad like in Hong Kong has its danger, like what happened to me way way back. When I was buying perfume there, I accidentally hit with my bag several bottles of perfume on display in a store along Nathan Road. Geez, I ended up paying and cleaning the mess. It was so embarrassing and humiliating. They even threatened me that if I don't pay in full, they'll call the police. I got so nervous, I can't imagine being imprisoned just because I accidentally broke two bottles of perfume. From then on, I stopped wearing perfume. I tried buying perfumes from our local department store here but those with very good scents cost a lot. This hinders me from buying locally. It is a good thing there's “FReSH FRAGRANCE BAR: the perfume store for perfume addicts”. I learned from Aj and Thei that it offers original perfumes at a cheaper price than those from department stores! That means you and I can now be Perfume Addicts because the price at this store is easy on the pocket! Yehey! Aside from that, FReSH‘s staff will be there to assist you if you don’t know yet the kind of scent that is perfect for your personality! Awesome, right? So what are you guys and gals waiting for? Check out FReSH on Facebook (http://www.facebook.com/freshfragrancebarand). Visit their stores now! FReSH FRAGRANCE BAR ‘enabled’ my Perfume Addiction once again. The FReSH Fragrance Bar, the Perfume Store for Perfume Addicts, offers different brands of signature scents at reasonable prices as compared to department stores plus they have perpetual promotions, loyalty programs and flexible payment schemes that a perfume lover would never really dare to miss. They have an extensive selection of premium imported scents that come at a reasonable price and a guarantee that what you're getting is the real thing. The luxurious signature scents I once coveted can now be truly within my reach because of FReSH Fragrance Bar! Yes! Fresh Fragrance Bar have made it possible for people to be able to afford the perfume they always wanted. 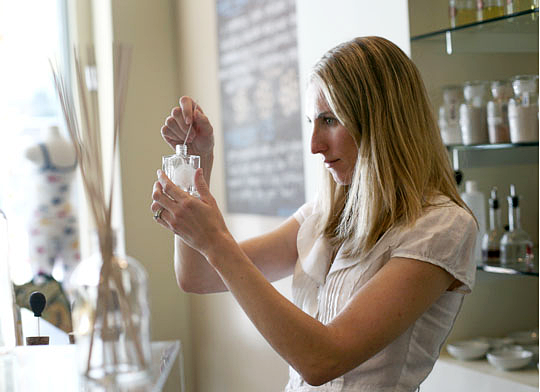 Layer the scent- I love Jessica McClintock! So I bought a Jessica McClintock soap cleanser, a Jessica McClintock powder, Jessica McClintock lotion and I use all of them before I apply the Jessica McClintock fragrance. The best way to apply perfume is right after you shower. Spray the mist in front of you and walk through it before dressing up because many perfumes can stain clothes. So apply perfume first before you wear your clothes. Don't dab or rub you wrists- this bruises the scent and damages the oils in it causing the scent to not last as long and change the way it should smell. Misting your hair is a great idea too because hair holds onto scents really well. With a mist, just hold one of your arm out as far as possible and mist in front of you so that the mist will land on your head as you walk through it. If you are really having a problem keeping the scent on you, spray or apply some to a cotton pad or ball and place it under your bra. This will help the scent linger all day long. 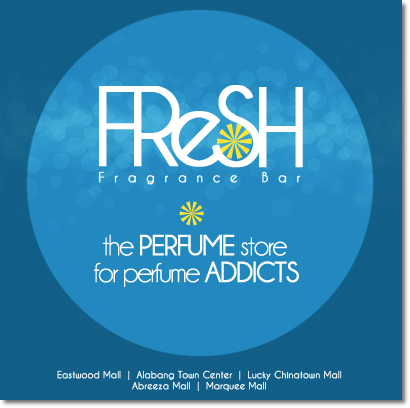 Fresh currently has five retail stores in Eastwood Mall, Alabang Town Center, Lucky Chinatown Mall, Marquee Mall Pampanga, Abreeza Mall Davao and several more to come. They have a branch in Abreeza Mall!